Two residents in our community have reported that bats have gotten into their units recently, so be extra careful when opening your doors and doorwalls especially in the twilight hours. Young bats are kicked out of their nests during the summer, which leads to more bats in dwellings — typically peaking in August. Our most recent unwanted visitor was captured by a brave member of our community by throwing a towel over it and carrying into the woods. If you use that methodology be extremely careful as the bones in their wings are very fragile. Your goal is to get them out of your house but not injure or kill them as they are an endangered species that is protected by law. They may look frightful but they really are a gentle creature that merely lost its way and they are an invaluable part of our ecosystem. 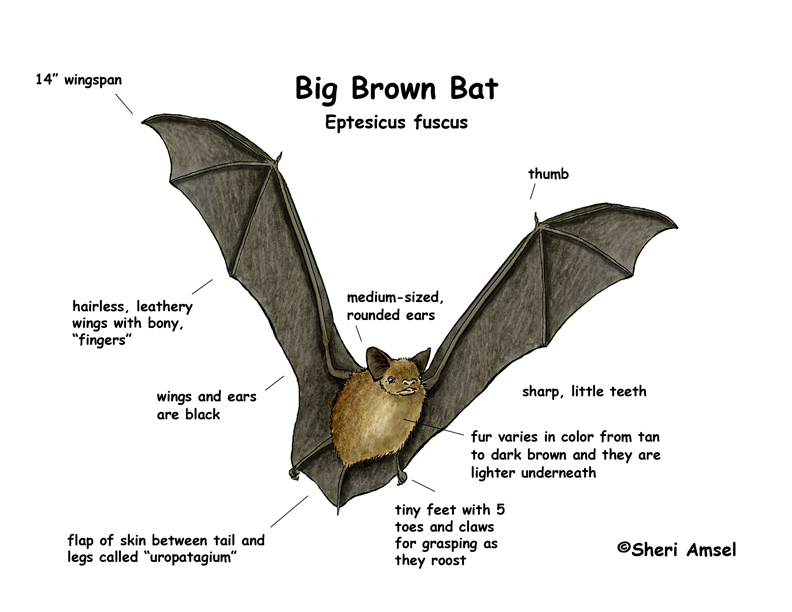 Michigan bats feed on a variety of moths, flies, beetles and other insects. When feeding under normal conditions they can capture 600 to 1,000 mosquito-sized insects per hour thus controlling the insect population and limiting the spread of diseases. “Bats can get into your living space several ways. If a window or door without a screen is left open, occasionally a bat can fly in after dark. If a bat is outside resting on the exterior of the house and is startled, it could fly through an opening. (Check under your retractable awnings by your doorways). A bat could fall down a chimney without a protective chimney cap screen….. Bats may look big when flying around, but they can get into or out of an opening about the size of the end of your little finger. Most weigh well under 2 ounces so they are actually quite small. It’s a guarantee: the bat is an accidental traveler. It does not want to be in the house or, in many cases, chased by shrieking giants with brooms and tennis rackets. The goal is to find a calm and peaceful ending to their intrusion. Once you are aware of the flying bat, the goal is to get the bat into a room where a door or large window without a screen can be opened. The first job is to put pets like dogs or cats into another room and shut the door. There is also a small chance that the bat could have rabies, so any contact is discouraged. Open the door or window in the chosen room and turn off the lights except for something very dim. Turn off outside lights that are near the open door or window. If an air conditioning unit is running near to the chosen door or window, turn that off, too. Bats use echolocation and not sight to navigate. Close off other rooms by shutting doors. All these activities need to take place in almost complete silence. The more screaming and shouting, the more upset the bat and humans become. Keep narrowing the flight area with two people holding opposite ends of a sheet up at arm’s length until the bat has nowhere left to fly except through the open door. When people swing tennis rackets or brooms at the bat, it may become aggressive and swoop toward the person’s head. The bat is trying to save its own life. It does not want to get tangled in your hair or have a collision with a large, heavy object like your 8-pound head. If it is necessary to pick up the bat, be extremely careful. Always use heavy leather gloves. A better solution is to put a plastic container over the top of the bat. Then, slide a piece of cardboard slowly between the bat under the container and the surface that the bat is clinging to. The containerized bat can be removed safely to the great outdoors. You and the bat will be grateful of this peaceful conclusion to the accidental invasion. Most bats don’t have rabies. For example, even among bats submitted for rabies testing because they could be captured, were obviously weak or sick, or had been captured by a cat, only about 6% had rabies. Just looking at a bat, you can t tell if it has rabies. Rabies can only be confirmed in a laboratory. People can get exposed to rabies when they are bitten or scratched by an infected animal, and should immediately seek treatment and inform their county health department. Safely capture the offending bat and retain for testing. Health officials also encourage people to collect the bat for rabies testing if the bat has been found in a room where people have been sleeping, near an unattended child or an impaired adult. Do not hesitate to contact a critter control company. A list of companies that are licensed to safely remove bats in Michigan can be found be clicking here.